Marnie Gilder is an abstract artist who creates beautiful, affordable, limited edition screen prints by hand. We developed a simple, elegant logotype and business card that is inspired by and complements the understated, abstract and organic forms in Marnie's artworks. 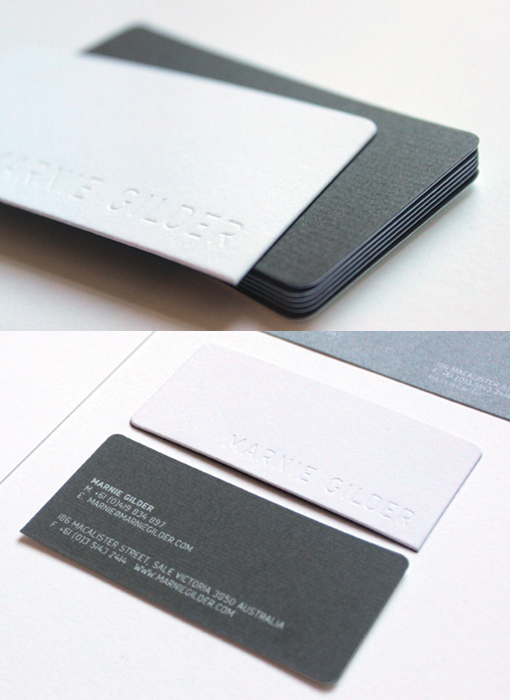 Her business cards are meticulously crafted to represent Marnie's handmade approach. Her logotype is letterpress printed onto a fine white, Italian cotton card which has been laminated to a charcoal grey uncoated card. Each card has been forme cut with three rounded corners and one straight corner to harmonise with letterforms in her logo. Her contact details are printed in silver ink on the reverse (grey) side of each card.